Hi, I'm Damian Gordon, I'm a lecturer in the Dublin Institute of Technology in the School of Computing. 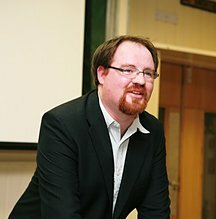 Damian Gordon is a full-time lecturer in the Dublin Institute of Technology School of Computing, and lectures on a range of data-focused Computer Science modules, and teaches mainly on MSc programmes. Before starting as a lecturer, he worked in the I.T. industry; and was employed variously in the roles of Software Developer, Technical Team Leader, Systems Analyst, Training Consultant and Implementation Consultant. In that period he was also responsible for authoring a wide range of technical documentation, including manuals and training courses. I worked as an Assistant Lecturer for a year in DIT School of Computing for a year before becoming a Lecturer. My work also included delivering a module on the MatLab programming language to the staff of the Schools of Computing and Mathematical Sciences. Serving customers in an Internet Cafe, also making teas, espressos, cappuccinos, lattes, and mochas, and serving light snacks. I also delivered training to customers on Using the Web, ECDL, and Java Programming, as well as some development of the corporate website. Working on the PEARL project whose aim was to make experimental work in science accessible to students with a wide range of disabilities. My role in the project was to develop a working computer vision system that can be controlled over the web incorporating an XY-Table, a range of lighting configurations, and Image Acquisition and Processing modules. Using this system software was developed to automatically estimate the amount of solder paste on printed circuit boards (PCBs) using a combination of epipolar geometry and spatiotemporal volumes. The work was done in conjunction with Machine Vision Technology (MVT). This role also involved lecturing and the development of assessment/teaching materials. Part-time teaching on a computer science module for students undertaking the international baccalaureate examinations. Working with project teams and customers designing and implementing changes to RENAISSANCE ERP system including Sales Order Processing, Purchase Order Processing, and ancillary systems. All developments done in proprietary GEMBASE 4GL and DCL command language. Projects included the implementation of a Stock Control system, and the development of an automated process to manage version control and auditing of software from Test to Live using DCL. Analysis, Development and Installation of enhancements and modifications to a number of ERP Systems, including Sales Order Processing, Purchase Order Processing, and ancillary systems, for a major food and agri-business group with operations in Ireland, Great Britain, continental Europe, Canada and the United States. Developments undertaken in the VMS and SCO-UNIX environments using the RULER 4GL programming language. Also responsible for training and support issues relating to these systems by several companies. Development of a 5-day training course on approaches to programming using the 4GL (Fourth-Generation programming Language) paradigm using the RULER 4GL as an example. Materials developed for this courses included Powerpoint slides, Instructor guide, Classroom activities and Take-home exercises. Additionally multiple deliveries of this course to staff and users of the RULER 4GL Programming Language and associated systems. Visiting Researcher to the Department of Computer Science, National University of Ireland, Maynooth. Researching and authoring reports on Computer Vision research. Guest lecturing on the topic of Computer Vision Also helped set up and configure Computer Vision Lab. Research on a feasibility study for the automated inspection of shadow masks for LG (Lucky Goldstar) Electronics in conjunction with the Department of Computer Science, Trinity College Dublin. My tasks included studying and modelling the biological processes underlying the human inspection process and co-implementing the computer-based solution using the KHOROS environment. Financial recordkeeping using SAS Version 4 ("portable SAS") to record and process expenditures, receipts, payroll and all other financial transactions for the organisation. Also responsible for handling large sums of money. I am a full-time lecturer in the Dublin Institute of Technology School of Computing, and lecture on a range of data-focused Computer Science modules. Currently the majority of my teaching is on the MSc programmes. Also I have participated in the design of several programmes and led the design of one of our MSc programmes, I have served as Year Mentor, Project Co-ordinator and Couse Co-ordinator for multiple programmes in the School. I have served as facilitator for DIT Away Days, employing creativity and teamwork techniques to help generate new ideas and new directions for those Schools in creating their five year strategy plans. Additionally I guest lecture on several programmes in other Schools and Colleges in the DIT on modules including Research Methods, Instructional Design, and Web Authoring.